Grammar Cop: Are You That Lazy, Boy? 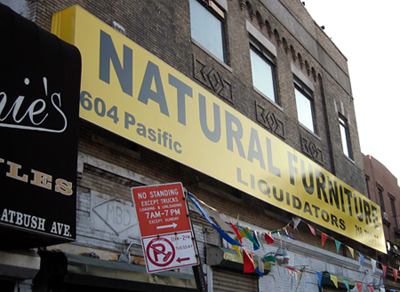 Defendant: Natural Furniture Liquidators, Brooklyn, NY. Count 1: Failure to correctly spell the name of the street on which your business is located. Count 2: Failure to spell an address correctly within 100 yards of a street sign. Count 3: Rendering a spelling error permanent by affixing it to a sign and/or awning. Count 4: Exposure of spelling deficiency on a public thoroughfare. Count 5: Repeated failure to notice. Report: Officer Wolchek of the Brooklyn Grammatical Minutemen witnessed the infraction near the corner of Pacific Street and Flatbush Avenue in Brooklyn. The crime took place in an area currently being considered for taxpayer-funded private development/property seizure – presumably under the pretense of clearing up grammatical blight. Fine: $238. Fine to be waived if defendant suffers eminent domain abuse at the hands of Brooklyn officials.